We want to make your romantic getaway in York, Maine a memorable one. That’s why we offer Maine vacation specials and packages designed just for you. 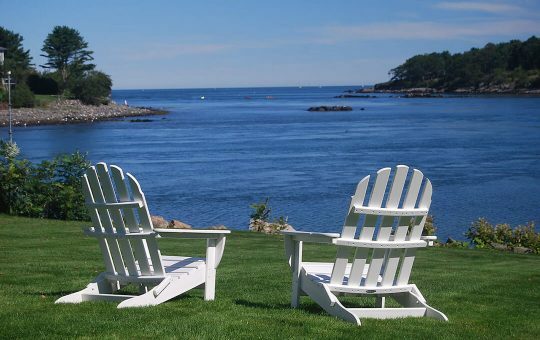 Enjoy relaxation, fine dining, and rejuvenation at one of the best places to stay in York, Maine. The rugged coastlines, beautiful lighthouses, sandy beaches, and quaint coastal towns among our many other attractions make Maine a special place to celebrate. Birthdays, anniversaries and other special events deserve special recognition, and what better way than a visit to Dockside and our beautiful York, Maine surroundings? Our base package includes lodging, dinner, and breakfast. You can then customize it with many great extras. The base package includes food and lodging taxes and lodging gratuity. *Does not include gratuity on dinner. Remind yourself of the days you spent relaxing dockside, with our brand new line of souvenirs! Perfect for both friends and family alike, these make great gifts . Choose from a variety of styles and colors when you purchase from our handmade coffee cups. Choose from a variety of styles and colors all with the official Dockside Guest Quarters logo. Our custom Dockside Guest Quarters coasters come in a set of four. These artisan crocks help to make the winter months a little bit warmer! Take a look at all of the unique colors and choose the crock that is perfect for you! 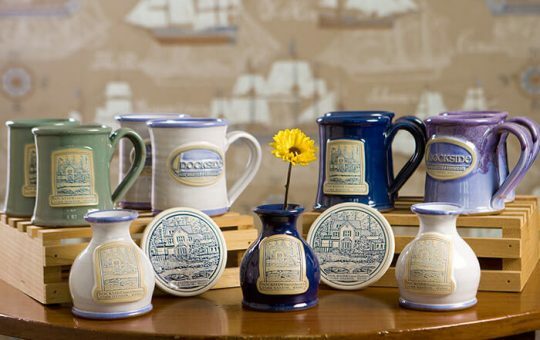 The perfect souvenir from your Dockside Guest Quarters stay. Our handmade, artisan shot glasses make the perfect souvenir. Call us today to purchase the perfect souvenir, 1-800-270-1977. Winter office hours are 9am-3pm, Monday-Thursday. 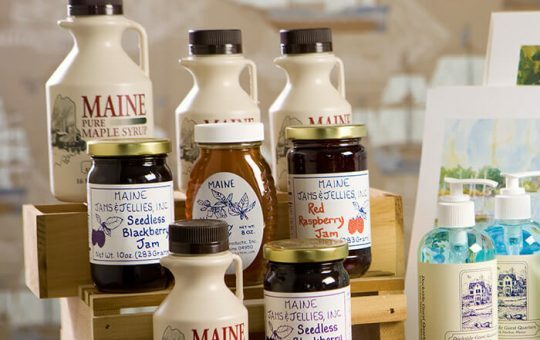 Have a taste of some of our favorite Maine jams when you purchase from our assorted Bleuberet products. Available in Blimey Wild Maine Blueberry & Lime, Bharbie Strawberry & Rhubarb, and In the Bluff Wild Maine Blueberry flavors. Available in 10oz jars, Maine Wild Blueberry Jam. Available in Wildflower, Wild Blueberry, and Wild Raspberry. If you’re craving a Dockside Guest Quarters breakfast once you leave, be sure to snag our Maine Pure Maple Syrup! Perfect for your pancakes and flapjacks, you can purchase this treat in a 6oz, or 16oz, container. Call us today to add a delicious treat to your stay, 1-800-270-1977. Winter office hours are 9am-3pm, Monday-Thursday. Pamper yourself or someone special when you give the gift of our wonderfully scented hand and body soaps! Or, give a set of our very popular cotton sheets. You loved the sheets when you were here, now you’re able to take them home! Our wrinkle free, combed pima cotton sheets have 600 thread count and are available in both white or tan. Pamper yourself or someone special when you give the gift of our wonderfully scented hand and body soap. 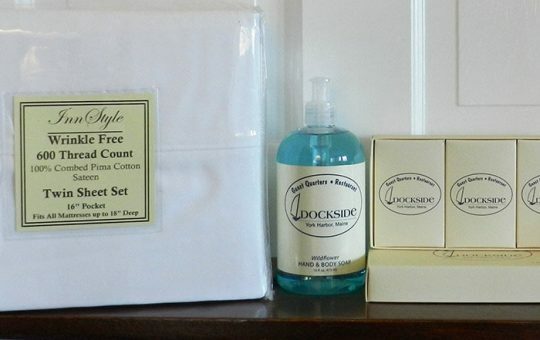 Our soap bar gift box set is perfect for bringing all of the smells of the inn back to your home! Available in a lavender or tea oil scent. Call us today to purchase our bed & bath extras, 1-800-270-1977. Winter office hours are 9am-3pm, Monday-Thursday.